When are inbound Express Path cards actually useful in Australia? This article is part of our ongoing Business Travel 101 series for newcomers to the world of business travel. When returning home, most Australian travellers love using the automated SmartGate lines to zip through passport control – which are often faster than the dedicated yet manned ‘express’ lanes – so why do airlines still hand out Express Path cards on arriving flights, and when are they useful? Here are just some of the reasons you shouldn’t leave that inbound express card in your business class seat pocket. If your travels have taken you to places like Africa, Central or South America or the Caribbean in the six days prior to your arrival into Australia, you won’t be able to use SmartGate after touching down: and even if you approach a kiosk, you’ll be directed to manual processing anyway. This is where your Express Path card comes in handy, because there’s no separate ‘Australians requiring a Yellow Fever check’ line at passport control – you need to line up with everybody else, so whip out that Express card and have your immunisation certificate ready for inspection. While this applies to all passengers arriving on non-stop flights to Australia from places like Johannesburg and Santiago, it also applies to those on connecting or multi-city itineraries, who may be arriving on flights from anywhere else. Although this might not apply to your regular business trips, if you’re returning home from a (well-deserved) family holiday and have a child in your party under 10 years of age, they can’t use SmartGate, which means you’ll need to accompany them through manual passport control. You’ll also need to queue at regular passport control with Australian children aged 10-15 years if there isn’t a second adult travelling with you. Even if you keep that Express card in your pocket for passport control and zip on through the SmartGate line, there’s another opportunity to skip the queues at the final exit, after collecting any luggage. Many Australian airports provide three exit paths: the green channel for regular travellers with nothing to declare, the red channel for passengers making a declaration, and the Express Path exit for eligible travellers – and during peak times, that Express exit can be very useful. Don’t forget, although you might be able to use SmartGate on arrival into Australia, many travellers can’t, which is again where such Express Path cards are welcomely received. Currently, Australian arrivals SmartGates can be used by foreigners with a passport from Canada, China, France, Hong Kong, Ireland, Japan, Macau, New Zealand, Singapore, South Korea, Sweden, Switzerland, Taiwan, the UK and the USA, but everyone else requires manual processing. 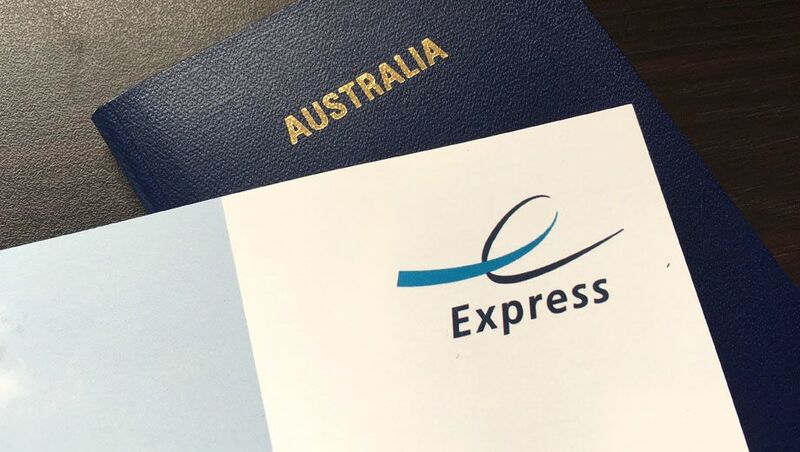 That said, all foreign nations travelling with children under 16 years of age must also be processed manually and can’t use SmartGate, even if travelling with a passport issued by the countries above – so whether you’re a local or are just visiting Australia, don’t toss that Express Path card! I often take a daytime flight back to SYD from SIN and when I arrive at 8pm-ish I breeze through customs, but when you arrive in the early morning peak the whole place is a zoo and it seems to me that the express paths aren't enforced and so when you most need it, the pass is useless. Completely agree. In SYD, the Express Path at Customs is often closed during peak times. I now have an interesting collection of different airlines’ Express Path cards which are collecting dust in a drawer. Express Cards really useful to skip the queues in Melbourne for the busy morning US and European arrivals (post luggage pick up). Almost always open as flight crew use this also. I have had customs officials tell me at MEL airport that the express cards are useless, don't mean anything and that they will be discontinued in the near future. In fact when you depart on an international flight, many carriers have actually stopped handing them out like CX and MH and if you want to use the express lane you just have to show your boarding pass which indicates you are flying biz or that you're an eligible frequent flyer. In any case if they have only 2 security lanes then the cards means nothing as they are chokers and you still have to line up with people who don't have any express cards. Mel airport is possibly the worst experience ever! I have literally never had to show a yellow fever vaccination certificate when traveling from Mexico, Cuba, Argentina, Chile, the Dominican Republic, etc. And I’ve been able to use the smart gates all these times. For Australian citizens, the SmartGate kiosks ask only one question before issuing a ticket, and that's whether you've been to Central or South America, Africa or the Caribbean in the past six days. Answer 'yes' and you're directed to manual processing, or answer 'no' and you'll receive a ticket as usual. Q11 on the incoming passenger card asks the same thing. It's possible that if you regularly travel from these regions, Border Force might have marked your travel profile as 'OK' for the Yellow Fever check and therefore permit you to use SmartGate, but ordinarily, if the answer to that question is 'yes', you can't. If you say yes to the Africa/Sth America question, the kiosk will then ask if the travel has been to a displayed list of countries - the ones for which the certificate is asked for - Peru, Brazil etc. If you say yes to this question, then you are bounced to manual. I did this in late December ex QF28, having been to Peru duly bounced but this was the only flight at the time, next to no queue. Interesting, thanks for sharing: the last time I tried after a trip to Brazil, the kiosk immediately advised I couldn't use SmartGate that day and should proceed to an immigration desk (without first showing a list of countries, only the yes/no question), so perhaps the kiosk was having a bad day, or the computer already knew I'd been to a Yellow Fever risk country. I will be visiting Buenos Aires and nearby Montevideo, returning through Santiago in May. The CDC advice is that Yellow Fever vaccination is not necessary for any of those places. If you check out their yellow fever map of South America you will see all of these places are well outside the danger zone. It’s mostly the equatorial countries included. Brisbane: even with the early morning arrival rush I have not had to queue at Customs. Only time was the week before the Commonwealth Games and that really showed how useful it is to kerp the Expess Path with you. Slightly off topic, but inbound to Heathrow for AU passport holders: I think holders can now use the eGates and these beat the Express Path tickets every time. Express Path is never Express! Is there an express path at Customs at Brisbane international? I have passed through a few times but never seen one. I regu;arly travel from NZ and alway get an Express card but have never used it. Melbourne has a customs express but Sydney it doesn't seem to matter. Yes, but it usually closes after about midday when the airport is quieter. Used it earlier this month after arriving at about 9am on a Friday morning when the main line had a good 150-200 people in it, yet I was out in a few minutes. When it's open, the entrance is over at the far left, so don't join the main line which begins up in the middle of baggage claim. I save the arrivals express slips and then give them to family and friends, who are flying economy and without status, to use on departure from Sydney. I have not tried it that often, but it seems to work because the individuals checking the slips in the security line are not expecting it. When was the last time these cards worked at Sydney for the final Quarantine exit lines...I've literally not seen a separate express line there for years. I've stopped accepting them now. Comment on "When are inbound Express Path cards actually useful in Australia?"